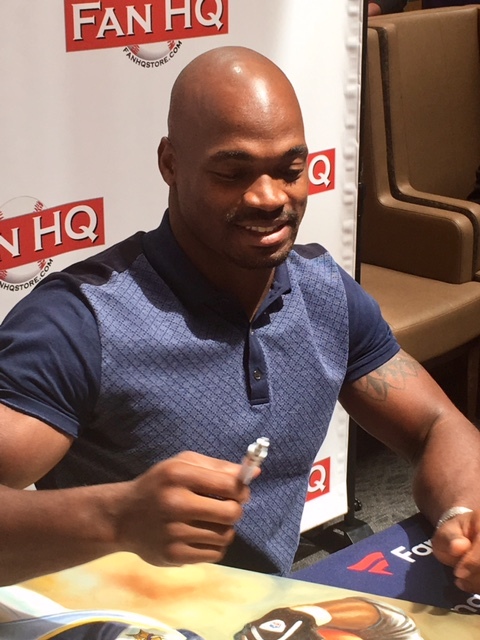 Here are a series of iFolloSports.com original photos chronicling former Minnesota Vikings and current New Orleans Saints star running back Adrian Peterson signing autographs, this past Saturday. In what could be one of Peterson's last appearances in Minnesota for a while, the future hall of famer met fans in the western Twin Cities suburb of Minnetonka. Peterson was very friendly, while interacting with the many patrons in attendance. The Vikings took Peterson with the seventh pick of the 2007 NFL Draft, with his long and electrifying carries instantly making him a very popular figure, right out of the gate. The Oklahoma alum was a seven-time Pro Bowl selection, three-time NFL rushing champion and 2012 NFL MVP. In his 10 seasons with the Vikings, Peterson totaled 11,747 rushing yards, along with 102 touchdowns (97 rushing, 5 receiving). After an injury plagued 2016 campaign, the now more injury prone 32-year-old and the Vikings parted ways during the current offseason. Just prior to the draft, Peterson signed a two-year/$7 million contract with the Saints, including a $2.5 signing bonus. It is bitter sweet for the Vikings and their fans to see Peterson in another uniform, but most agree that it was time to move on. Ironically, in a very highly touted game, the Vikings will host Peterson and his Saints teammates, during Week 1 of Monday Night football, at US Bank Stadium. NFL fans can check out additional iFolloSports.com original stories of Peterson signing autographs, over the past few years. Here is AP signing during Vikings training camp in 2013. This shows AP interacting with fans at Vikings 2014 training camp.